I love cooking with fresh veggies in the summer. I also love it when you can find a pasta recipe that is light and flavorful and doesn't weigh you down during those HOT summer dinners. When I first came across this recipe I was so excited at the idea of combining zucchini (which I LOVE) with spaghetti. I'll admit I was a little skeptable because there wasn't really a sauce in this recipe. I am used to including some sort of red, white or cheese sauce in my pasta dishes and I was afraid it was going to be kind of dry and bland. I also use gluten-free rice pasta, which sometimes can taste a little off if you don't have thick sauce to go with it. It does have a different taste than typical pasta, and until you get used to the different taste you kind of need a thick sauce to cover up the flavor a bit. I am getting used to it, so that probably helped as well. This dish turned out to be very flavorful and will probably become one of my regulars. I used a spicy Italian chicken sausage with fire roasted peppers which helped to make the dish flavorful and a little spicy. The garlic infused olive oil also helped to add some flavor. I also reserved some of the pasta water to help keep the spaghetti from drying out and it helps the dish to thicken up a bit and kind of form a sauce with the garlic infused olive oil. 1. Heat a large skillet over medium-high heat. Remove the sausage from their casings, add to the skillet and cook until no longer pink, breaking it up as it cooks. Remove to a plate and set aside. 2. Turn heat down to medium and add extra virgin olive oil to the skillet. Add garlic and cook until smelling flavorful, about 1 minute. Add zucchini, season with salt and pepper, then sauté until tender, about 4-5 minutes. Add cherry tomatoes then place a lid on top of the skillet and allow tomatoes to get hot and tender, about 3 minutes, stirring once or twice. 3. Meanwhile, cook spaghetti in a large pot of salted boiling water. I cooked 8 oz of gluten free rice pasta and 8 oz of regular pasta. Make sure to reserve 1 cup pasta cooking water before draining. Because I was preparing a gluten free version, I used the pasta water from the pot of rice pasta to keep out all of the gluten. 4. Add cooked chicken sausage to the skillet with the zucchini and tomatoes. Add this mixture to the top of your pasta and drizzle a little pasta water over your serving. 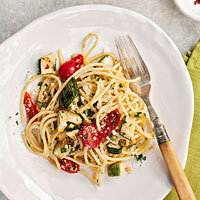 Serve topped with torn fresh basil, and grated Romano or Parmesan cheese, if desired. Yum!!! I just discovered Iowa Girls Eats and she has not disappointed me yet with her deliciousness. This looks like another winner!